Free Download Links of APPSC Group 4 Previous Papers with Key provided. Applicants can now get the Andhra Pradesh Group IV Services Exam Old Question Papers PDF. you may also visit the APPSC Official Website www.psc.ap.gov.in for more APPSC Previous Year Question Papers in English, ఆంధ్ర ప్రదేశ్ పబ్లిక్ సర్వీస్ కమిషన్ గ్రూప్ 4 Model Papers Telugu Medium. The APPSC Gr 4 Exam Date is also officially announced. 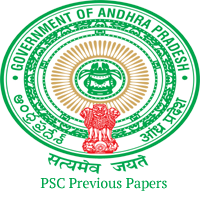 Download Andhra Pradesh PSC Junior Assistant Last 5 Years Exam Papers PDF. Are you looking for the Andhra Pradesh Group 4 Previous Papers? Then, you have landed at the correct place. Applicants can initialize your preparation with the help of APPSC Group IV Services Sample Question Papers. No need to search for many platforms to get the Andhra Pradesh Public Service Commission Gr 4 Solved Papers. Because here we have provided the free download links of APSPSC Junior Assistant Last 5 Years Question Papers PDF. You have the choice to get APPSC Group 4 Previous Papers in Telugu & English Mediums. One thing you need to do to get the Medium wise Andhra Pradesh Group IV Practice Papers is just click on the required link and click on Download Icon available at the top of the page. You must remember that the APPSC Exam Old Papers provided here are for the sake of applicants practice purpose. Andhra Pradesh State Public Service Commission Group 4 Notification is going to be out soon. A huge number of candidates are eagerly waiting for Groups Notifications. Now, those can refer the details of Upcoming APSPSC Notification here. The APPSC Group IV Services Recruitment Notification will be available in the Official Website www.psc.ap.gov.in This recruitment is to fill the vacancies of Junior Assistant. Interested applicants can prepare well for the APPSC Group 4 Exam 2017. Those who are initiating preparation can check Group 4 Exam Pattern first and then download the APPSC Group IV Services Previous Year Question Papers PDF. Commission Name Andhra Pradesh State Public Service Commission (APPSC). Name of Posts Junior Assistant in Several Departments. Deadline for Submission of APPSC Gr IV Application Not Yet Announced. APPSC Group 4 Prelims Exam Date 10.12.2017. Group IV Mains Exam Date 25.04.2018. APPSC Group 4 Exam consists of Paper I & Paper II. General Studies Questions will be asked in Paper I. Paper II contains the Secretarial Abilities Objective Questions. Each Objective Question carries ONE Mark. Negative Marking Scheme may be applicable. The time duration for each of Two Papers (I & II) is 150 Minutes. Total Duration for the APPSC Preliminary Exam is 5 Hours. The test is conducted for a total of 300 Marks. First of all, check the APPSC Group 4 Exam Pattern 2017, Marking Scheme for each Paper, Negative Marking applicability, various all factors before starting the preparation. Then, download the APPSC Group 4 Syllabus for Preliminary Exam. Applicants can find the APPSC Group IV Previous Year Question Papers in PDF formats along with the Solutions. Just click on the required link to get the respective AP Gr IV Practice Paper. The Links are also provided to download APPSC Sample Papers for Secretarial Abilities and General Studies separately. Practicing the Asked Question Papers which are gathered from Previous Papers will help you in improvising time management skills. So, better to download the Andhra Pradesh Group IV Services Exam Old Question Papers and solve the asked questions. Also, you can allot time slot for each section in the time of preparation. This time Management will help you in making the plan of time management in Group IV Exam. If you are comfortable with Telugu Language only, you can download APPSC Group IV Previous Papers in Telugu Medium. Start practicing the asked question and compare your answers with solutions provided in model papers. Else, you can also get the APSPSC Group 4 Service Old Papers in English and continue this procedure. Here, we have provided the APPSC Previous Papers Free Download PDF Links. Candidates who want to apply for the APPSC Group 4 Recruitment 2017 can begin your preparation. The Previous Papers will be helpful in the every competitive exam preparation. So, appsc applicants can download the APPSC Group 4 Previous Papers with Key from the enclosed links. Find the separate links of APPSC Group 4 Previous Papers in Telugu, APPSC Group 4 Previous Exam Papers in English Mediums. Applied candidates can download the required Andhra Pradesh Public Service Commission Junior Assistant Model Question Papers. Also, the Andhra Pradesh Group IV Services Exam Last 5 Years Question Papers available in the Official website. Downloaded candidates can use these APPSC Exam Sample Papers for your practice reference. Keep Watching this page for more Latest Updates about the APPSC Group 4 Exam 2017. The Andhra Pradesh State Public Service Commission given the APSPSC Group IV Services Prelims Exam Date as 10th December 2017. Stay tuned to www.previouspapers.co.in for all Government Exam Previous Papers.